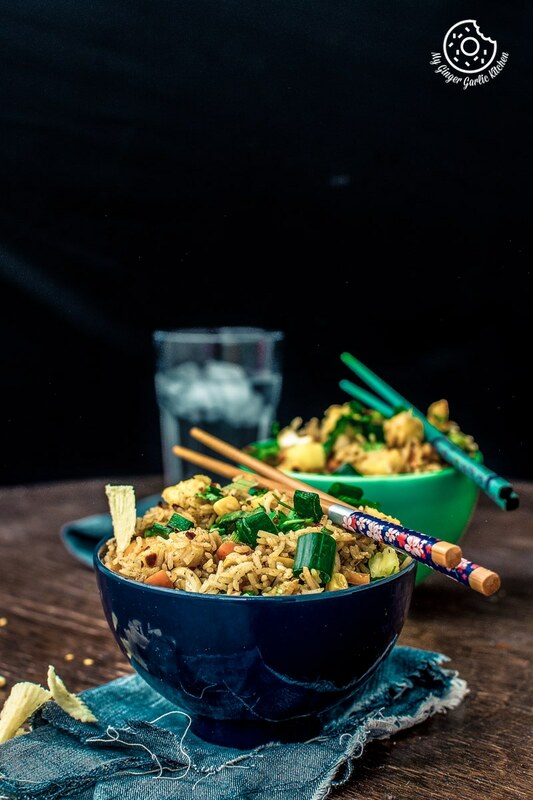 How to make Thai Pineapple Fried Rice – Vegan Recipe. 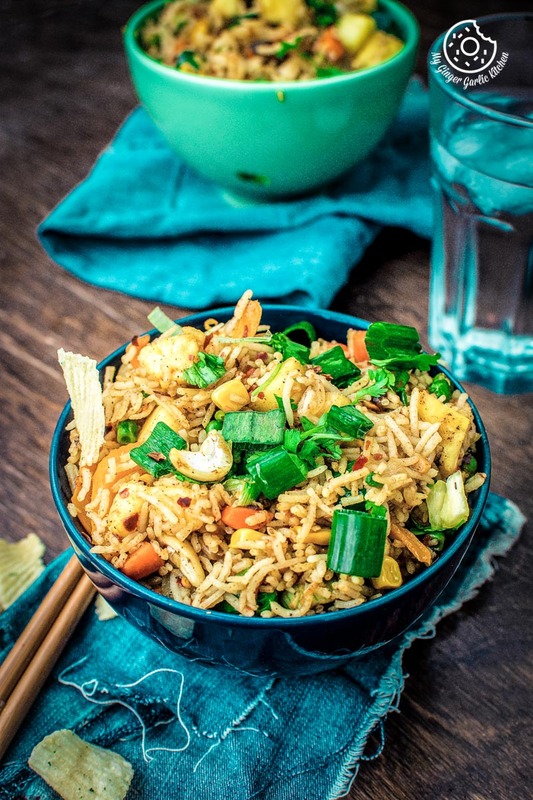 If you’re looking for a lip-smacking 15-minute meal, then give this quick and easy fried rice dish a try which is made with leftover rice. I am so much in awe of the ease of making this humble meal, which makes it a weeknight favorite meal. Or sometimes it can be a lazy weekend meal too. Anyways, how could anyone not love a beautiful, delicious, and satisfying meal? 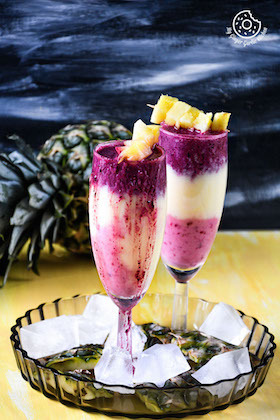 Pineapple and all things nice can make a quick, easy, and delicious meal. Won’t you agree? 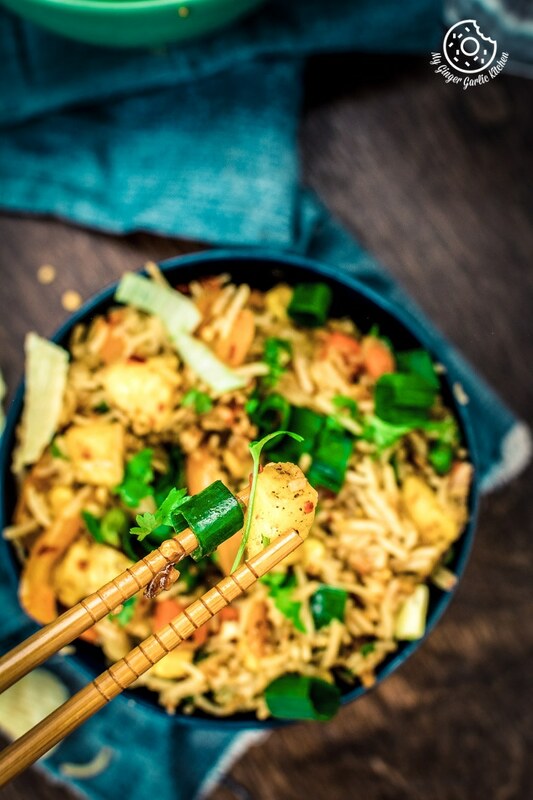 This super simple and fast Thai Pineapple Fried Rice recipe is the answer to all your queries. Plus, it’s surely just as good, and as fast as all fried rice recipes should be. Why you need this dish? If you are looking for a delicious meal which can be ready in just 15-minutes, then, this is your answer. It comes together in only about 15 minutes. Yeah, a good food comes together fast. Isn’t it great? If you don’t know what to do with leftover rice, then this is your answer. This fried rice works best with leftover cooked rice. 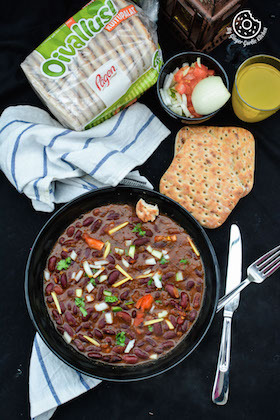 And if you just want to please the crowd with quick, easy and yet a most flavorful and delicious meal; this dish is your answer. 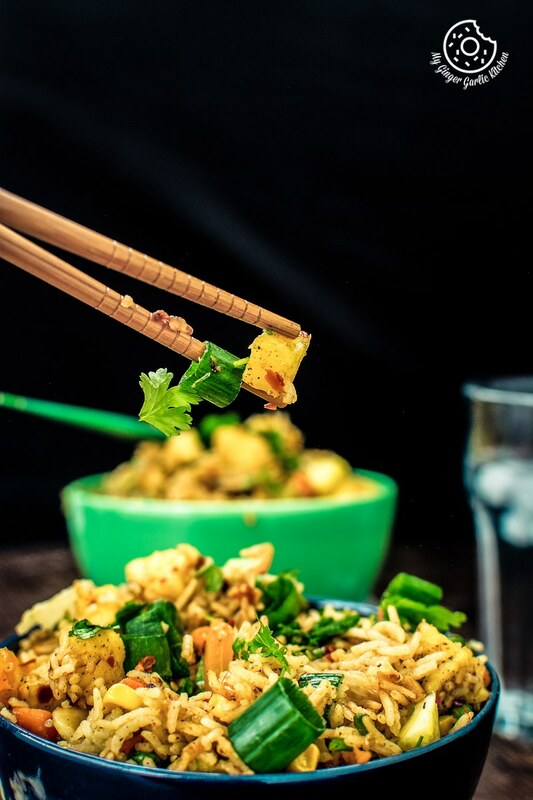 The recipe of pineapple fried rice I am sharing today is the vegan version of Thai fried rice. This is not 100% traditional Thai fried rice since I didn’t add any chicken, or egg or any fish sauce to it. But I can say that this fried rice is 100% vegan. And it could also be turned into a gluten-free meal if you add gluten-free soy sauce to it. Do you guys remember the first time when you had pineapple fried rice? 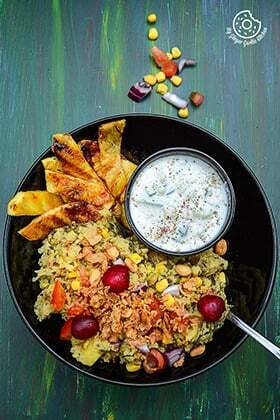 The first time when I had this vegan version of pineapple fried rice was in a Thai take-away food joint here in Finland. And believe me, it was love-of-taste-at-first-spoon. I just admired the sweet, fresh and juicy pineapple, which was combined so well with the veggies, rice and soy sauce. And it looked so swoon-worthy due to bright and colorfulness of this dish. Why you’ll love the fried rice recipes so much? Well, if you ask me, I am kinda obsessed with any type of fried rice. Be it Chinese fried rice, Thai, or Indian fried rice, I just love any dish associated with the word ‘fried rice’. 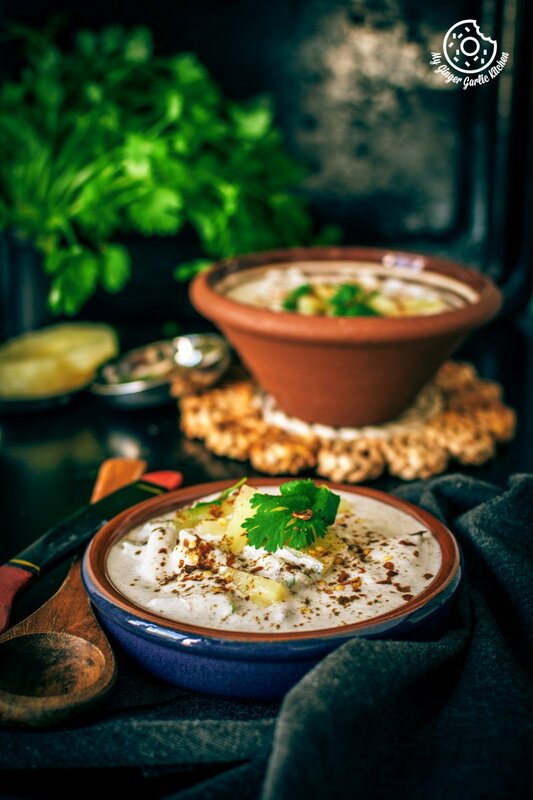 The main reason to love them is the ease of making this dish at home. It is so easy and it can be made in almost no-time. If you have leftover rice, and veggies chopped already then it takes just a few minutes. And what’s not to love in a dish which contains colorful veggies, rice, garlic, curry powder, cashews, and juicy pineapple? Fried rice always turns out amazing. 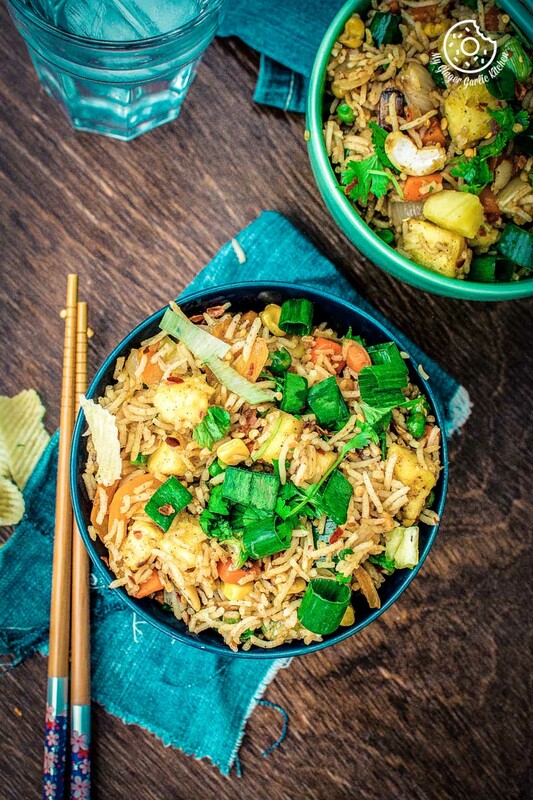 This vegan version of fried rice is a perfect meal for vegans and vegetarians. But feel free to add your favorite meat/seafood or eggs. 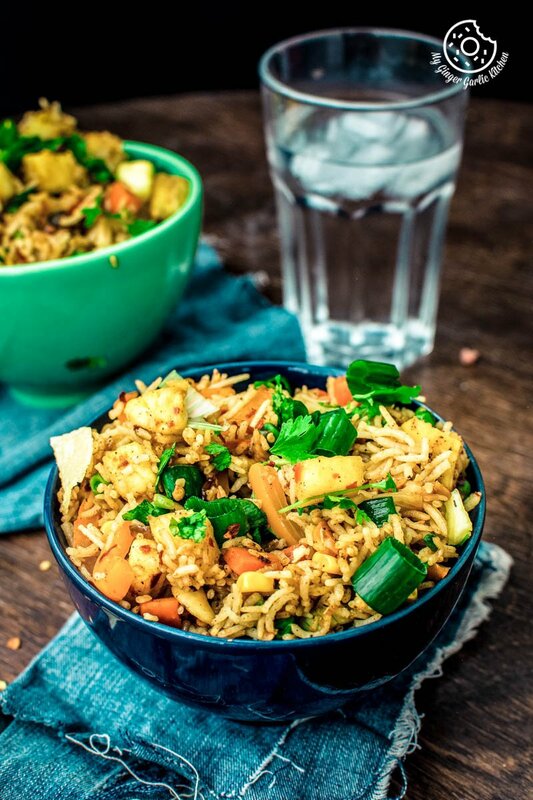 You can also make this pineapple fried rice with freshly cooked and cooled rice. But in my opinion, leftover rice works great here. 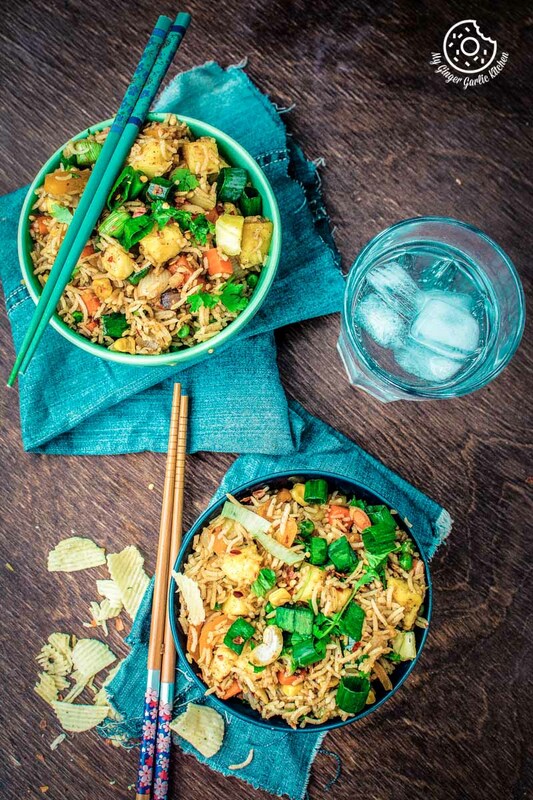 So in one way this pineapple fried rice is a charmingly addictive way to use up leftovers. Fish sauce is also added to this fried rice, but I didn’t add any here. So if you like fish sauce, feel free to add it to this rice. 1. Heat 2 tablespoons olive oil in a wok or a large skillet over high heat. 2. Add the onions and saute for 2 minutes. 3. Now add the minced garlic and sauté for 1-2 minutes, or until light golden in color. 4. Add carrots, green peas, corn kernels, bell pepper. Saute 2-3 minutes, or until veggies are lightly sizzling and fragrant. 5. Add cooked rice, pineapple, scallions, cashew nuts, chili flakes, Thai curry powder, salt, soy or tamari sauce and black pepper powder. 6. Stir well. Cook while stirring frequently for 3-5 minutes; until well coated and heated through. 7. Garnish with the green coriander and scallion greens.